In Bookshop Santa Cruz a few days ago, I saw the hardcover Guinness Book of World Records 2005 edition, flipped to the index and flipped back to page 105 and saw the small official record blurb. A mom and her son were perusing a copy next to me and I nudged them and pointed to my mini-paragraph of infamy. It was a proud moment. Not proud enough to cash in for the book, though. So here's a picture of the official certificate (944k). I kinda thought this thing was dead but there have been rumblings of interest here and there: a front-page spot in the Ukiah Daily Journal, a spot in The Press Democrat's Tuesday edition, and the UC Davis alumni magazine wants to chat. "A probably distant cousin of me in America has improved the world record that I can improve each day according to me, however, on the municipality house. Then Meyer made a paper clip collar of 40,000 stuks 24 hours." "Long live the average civil servant," proclaims a reader. Anyone speak Dutch? Previous world record-holder Rickard Blomqvist e-mailed his congratulations also. The world is so much shinier up here where I am now, but I won't forget the little people. I was on Seattle radio a week ago -- 100.7 The Buzz. I didn't realize I had signed on to be the morning hosts' quirky punching bag but one of them started needling me about how lame it/I was. Having already heard every variation of "get a life" in existence and still having loved the paperclipping experience enough to do it twice, the whole thing was kind of boring. We parted ways without any love lost. I'll be speaking to a first grade class in short while about "perseverance". The opportunity to mold and twist the leaders of tomorrow into my image is really what this paperclip thing has been all about. If you see a zillion guestbook entries written in crayon you'll know why. My record was officially approved by Guinness on March 9 at 1:03PM. It's done. My certificate is on its way across the Atlantic and I'll post a picture once it arrives. Thanks to everyone who made this possible. One more article in the Sacramento Bee. A blurb in Education World. For any Washington readers, I'll be on Seattle's The Buzz 100.7 radio show Monday morning (3/1/04) at 7:45AM. A few days ago I heard my name called on the intercom at my high school. I called the office and found KFBK News Talk Radio holding on the line for an interview. I had to teach a class but you just don't say no to KFBK. I got someone to substitute for a couple of seconds and then had a nice chat with their morning hosts. I'm afraid there's no link to that, but there have been a couple of news stories (one is archived here) and a feature on Paul Harvey's morning radio hour. (Windows Media Player; RealPlayer; relevant portion is 13:45 seconds in). Not sure how long these links'll be up, but it's good fun while it lasts. Just a quick note before a larger update tomorrow (with pictures!) because I'm dog tired. I chained paperclips for a full 24 hours, stopping three times to use the bathroom and twice for caffeinne. By the last four hours, my right wrist was shrieking and I couldn't get my fingers to do anything I told them to. Those were the worst hours of the challenge. All the others were a tie for the best, with multiple friends and accomplices stopping by to help massacre a short-standing Guinness World Record. "Break," is simply too timid a word to describe how high these people helped me raise the bar on this record. 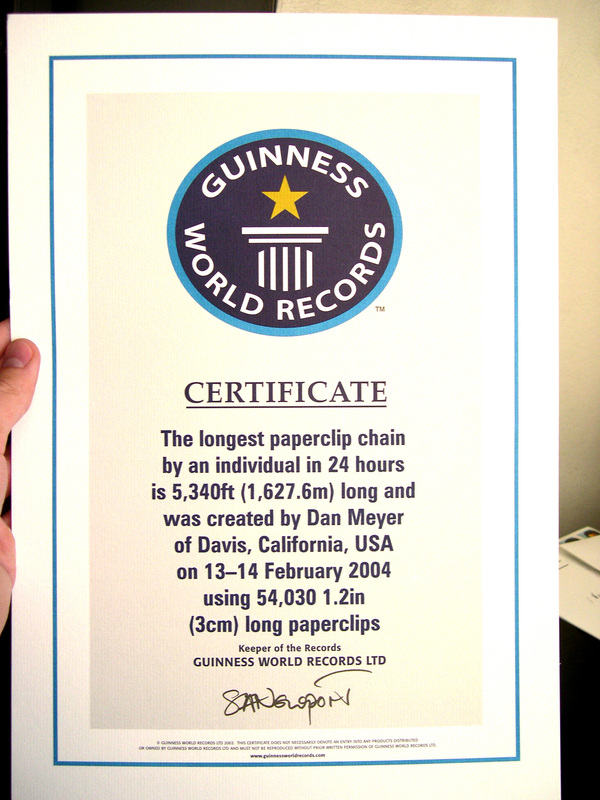 With the help of some 25 clip-pushers and spool-spinners, I maintained a break-neck pace of 1.60 seconds per clip, which was good enough to construct a mile-long paperclip chain (5340 feet, actually, beating the old record by nearly 2500 feet.). All that remains is to see if Guinness will accept our evidence supporting our claim. Who knows, but thanks to all who participated. Photo album up tomorrow. I was driving along today when I started daydreaming. I started thinking "what if current record-holder Rickard Blomqvist came from Sweden with some of his thuggish Norse friends and chased me around in a truck, with an automatic weapon of some sort, trying to mow me down before I broke his record." I swerved a little bit on the road. It's definitely time to get this over with. The last of the paperclips came today. Much obliged to OfficeDepot for their cheerful support on this one. It's been far more fun with corporate sponsorship. Got a little help from the HomeDepot folks in figuring out how to mount the spool yesterday. A large pipe and chairs for stands will work fine. Was interviewed by Diane Geng of The California Aggie yesterday. The question of "why" is pretty near impossible to answer without running on for 20 column-inches or sounding insane. There's a good reason, I promise, and it's not "because I forgot to renew some prescriptions." No paperclips yet. Fingers crossed on this one. Now this took me by surprise. Apparently twenty days before we tried to break the record last year, a 22-year-old Swedish kid named Rickard Blomqvist was doing the same thing. He was successful whereas I crashed gloriously, but he quit after only 14 hours, after adding only 167 feet to the record, having no idea that across the Atlantic, forces were already working to thwart him. The record page is online here. All I have to say is that, should we thrash the record by the margin we did last year, I'll feel a lot less guilt knowing it isn't a kindly old lady we're dethroning. I have both witnesses from last year signed on to observe the event, which is exciting. To accommodate all our schedules, though, we're moving the event's starting time from 1PM to 6PM on Friday, February 13. There will be much less daylight (if any) when we set out to measure the chain the next day, so we're trying to fix ourselves up with a reliable light setup for the cameras, which will be rolling. What remains is to secure newspaper coverage and eager volunteers to push paperclips towards me and spin the spool in two-hour shifts. (Okay, eagerness is optional. I just need bodies, folks.) Anyone in the Davis/Sacramento area interested in helping, please contact the management. Sudden Update: One of our witnesses is looking like he can't make it. Any takers? Our time is now. First, a big thanks to Dave Fillingame, one of last year's witnesses, who is signing back on to spend another 24 hours watching me chain paperclips together. Second, big big ups to SMUD for letting me dig around in their trash for a fantastic spool. Those of you who have been following this project from day one know that finding something sturdier than the carpet tube we used last time has been a 500-pound gorilla anxiety for me (until today). (Special thanks to Lynetta in the guard tower for pulling some strings for me.) Third, Office Depot has offered to pony up paperclips again. I didn't have much hope for that kind of generosity to strike twice, but here we are and I'll be proud to fly their colors on game day. The only real concerns at this point are garnering sufficient media coverage to satisfy Guinness and finding enough able-bodied volunteers to push paperclips at me around the clock. Last year in May, a group of volunteers and I unofficially broke the record previously held by a Belgian woman for the longest paperclip chain made in 24 hours. Unfortunately, the chain tangled on the spool we had built for the occasion, violating Guinness rule #1 that the chain be measured accurately, straight, and end-to-end. So less than a year later, with an idea for a better spool, we're back at it. Our goal is to break the record (obviously) but with as little expense as possible. Caffeine, paperclips, and shipping are all pricey. Office Depot generously provided 50,000 paperclips last year and I have a small remainder available for this attempt. Further donations cheerfully accepted here.